The Georgian Temple Hotel was originally an annexe to the Old Bath Hotel. In 1840 William Adam mentioned that the poet Lord George Byron had stayed at the Old Bath as a very young man and he was in Matlock Bath whilst unsuccessfully wooing Mary Chaworth, etching his name on a windowpane at the Temple. Ebenezer Rhodes wrote, in 1824, that "In addition to the inns there are many comfortable lodging houses, the principal of which is kept by a Mrs. Evans, and known by the name of the Temple. This excellent house stands in a retired situation on the side of the lower part of Masson, and is certainly one of the most delightful residences in the place. It is connected with the Old Bath by a spacious terrace carried along the side of the hill, which forms a most delightful promenade". The promenade that Rhodes was describing was Temple Walk. Mrs. Hester or Esther Evans (nee Shore) is listed at the Temple in early trade directories and lived there with her son Walter Mather Shore Evans, an Attorney. She was the widow of Aneas or Eneas Evans who had died in 1813; the couple had married at Bakewell on 12 Nov 1792. By 1842 the directories described the Temple as a family hotel and the Evans family were involved with running the hotel for most of the nineteenth century, often listed as "Hester Evans & Co.". Esther Evans died in 1849, aged 82 and Walter died in 1876. His kinsman John inherited the hotel and lived there until his death in 1889. Towards the end of the century James Hand, James Haslem late of Bolton and then, a little later, John Barker were the licensees. possibly added in the 1930s, can be seen in this picture. The hotel's proprietors during the first half of the twentieth century included the Wheatcrofts, Mrs. Storey who had previously been at the Royal Hotel, George Ernest Putnam and Eric Moyes. 1903 advertisement, Ward Lock Guide when John Weaving was the Proprietor. He was there by the time of the 1901 census. 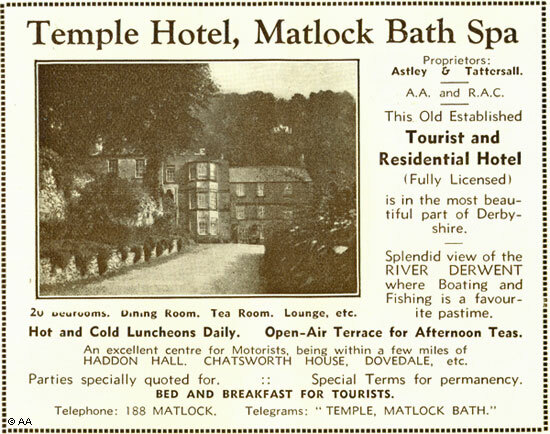 1930s advertisement, from the Official Matlock Guide when Astley & Tattersall were the hotel's Proprietors. Mr. and Mrs. Trippett ran the Temple from the 1950s to at least the mid 1970s. Whilst this writer is unsure how long they kept it up, the couple very generously hosted several annual Christmas parties for local school children in the bar on the ground floor. The parties were considered a great treat at the time. 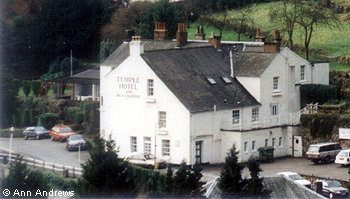 The Temple, photographed in 2001. 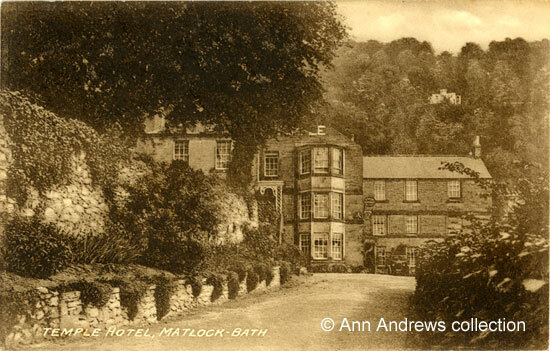 Lists Through the Centuries: Arrivals at Matlock Bath, 1820-1850. European Royal families and nobility, British politicians, academics, clergy, members of the British aristocracy and upper and middle classes of society. Some of them would have stayed at the Temple. 1. 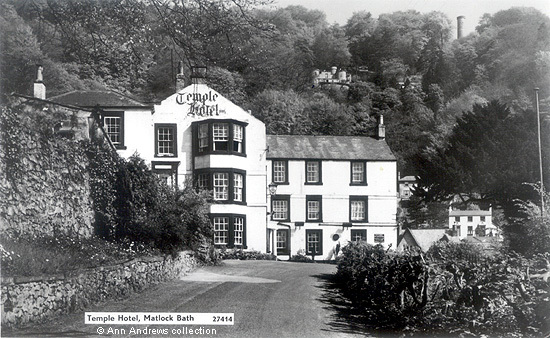 "Temple Hotel, Matlock Bath". Ed. J. Burrows, Publishers, Artists, Printers, Cheltenham. Printed in Great Britain. Unused. 2. "Temple Hotel, Matlock Bath". No 27414 "Real Photograph" postcard, posted 15 May 1961. The message is unrelated to the card. 4. Advertisement published in "The Matlocks, Derbyshire. Official Guide" Issued by the Come to Derbyshire Association, published 1930s. Images in the collection of, provided by and © Ann Andrews. The hotel is not shown on the Inclosure Map (Inclosure Acts 1776 and 1780) but is thought to have been built shortly afterwards and was initially a private house. Adam, W. (1840) "The Gem of the Peak" London; Longman & Co., Paternoster Row. Byron's etched verse is no longer part of a window. The pane has been removed and placed in a display cabinet within the hotel. Unfortunately, it is no longer in one piece. Rhodes, Ebenezer (1824) "Peak Scenery" pub. London, Longman, Hurst, Rees, Orme, Brown, and Green, Paternoster Row. Various 19th century directories list the Temple as a lodging house but see Pigot's of 1842 for the first reference to it being an hotel. Walter was baptised at Cromford - see Strays. Esther Evans was buried at St. Giles'. So were Aneas/Eneas and Walter. Sarah Evans, John's widow, transferred the license in 1890 ("Derbyshire Courier", 19 Apr). James Hand is shown at the hotel in the 1891 census. James Haslem became the licensee in 1894 ("Derby Daily Telegraph", 18 May) and just over a year later John Barker, late of Derby, was running the Temple (Kelly's 1895 Directory | Kelly's 1899 Directory). Mrs. Maria Wheatcroft can be found at the Temple in Kelly's Directory 1908 and Kelly's Directory 1912. S. F. Wheatcroft was there in 1916 (Kelly's Directory 1916). Mrs. Storey's name was in several newspaper advertisements 1919-22; she was the wife of George Storey - see Royal Hotel & Baths-(2). Mr. Putnam is listed in Kelly's 1928 Directory and Mr. Moyes in the 1939 Register.